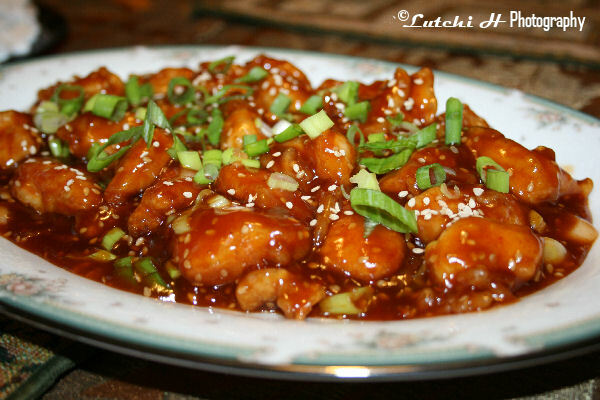 Sesame chicken is always been my one Chinese food favorites. I felt a little bit disappointed though because I cannot find a sesame chicken as good as in the Chinese restaurants in the Philippines. We went to a Chinese restaurant in the city for Mother’s Day celebration because I was craving for some but to my dismayed the sesame chicken I ordered tasted like sweet and sour chicken. It was lacking of something, it was gooey (too much cornstarch “I guess”), no sesame taste at all. Oh well, I wish we can find a decent Chinese place in this area who cook authentic Chinese food. Anyway, I just need to learn how to make it so I can enjoy this delicacy with pleasure. I have been surfing online for the recipe and even tried couple of them. But this recipe (captbunzo -opensourcefood.com) is so far one of the best out there. I made some changes of course to cater my taste bud. I hope you will try this sometimes. It’s a very tricky recipe, so be cautious when adding vinegar and sugar. You can add them slowly until you achieve the desire taste. 3- 4 boneless chicken breasts cut into serving size. 1. Wash, pat dry and cut the chicken into 1-inch cubes. 3. Marinate the chicken for 20-39 minutes. - In a medium bowl. Mix together all of the sauce ingredients “EXCEPT THE VINEGAR AND SUGAR). - “This is the tricky part”. Using a spoon, slowly adding the vinegar and sugar mix until you achieve the desire taste. Remember! You can always add or cut down. - Set aside when you achieved the taste. 5. Deep fry the marinated chicken cubes a few at a time until golden brown. 6. Drain on paper towels. You can cover the fried chicken with aluminum foil or place it on the warm oven while continue frying. 7. Last, get a wok (if you have any) or deep frying pan. 9. Sautee garlic until golden brown. 10. Add the sauce, cook, until slightly thicken. If you think your sauce is too runny then you can always add more cornstarch by diluting it first with water. 11. Add the fried chicken. Stir. 13. Sprinkle the green scallion. Enjoy it with steamed or fried rice ! This is a very nice recipe! Love to try this.